a little while ago i did a post on kicking off the new year with trying juicing or another kind of cleanse since i had been unhappy with my eating habits during the holidays. however, i received a lot of negative comments about how people didn't believe in "fad diets" or "quick fixes". i felt the need to explain that i, as well, do not encourage any sort of quick fix and believe strongly in living a healthy lifestyle. i work out 3-4 times a week (including yoga- a favorite), try and eat pretty healthy for the most part, but don't deny myself things when i want them (mostly for sanity reasons). i feel being healthy in body, mind and spirit is essential to live a balanced and healthy lifestyle. i do not sit on the couch, eat potato chips all day and then expect a 3 day diet to fix my problems. with that being said, i have still been really wanting to try a cleanse to get my body back to craving healthy things rather than sweets and junk food (holidays do it to me every year), and not necessarily for weight loss reasons. i had heard great things about suja and had a friend that had tried it that said she actually liked the juices. i decided it was the easier, more efficient, and no clean-up way to juice and decided to try it out. so far, it has been two days and i am on my final day today of the 3-day cleanse. although online they have an actual "system" and a specific order for the cleanse, i went with mostly all green juices because the expert at whole foods who had done it for 20 days drinking nothing but suja, recommended sticking with only green juices for the best cleanse. my body feels amazing. it's definitely not easy, and i may have cheated the first day with a sweet baked potato (which the website okay'd if you do need something solid), but i have realized how much self-control i have and have been in awe at how my body feels when cutting out all the breads, sweets, and fatty carbs that keep you from feeling this good! within only 2 days i have noticed a better complexion, more energy, a more clear mind, and just feeling better all around. i have actually craved sweet potatoes and broccoli a lot and haven't had one craving for chocolate or starbursts (my weakness!) i have lost a few pounds as well, but again, this is not what i am going for. just a slight added bonus :) to those of you interested in trying a cleanse or juicing, i would recommend this cleanse all. day. long! this was my first day and i ended up drinking one more green drink. they actually recommend you drink 6-7 but i haven't been able to do more than 5 because i just can't handle that much liquid! 5-5 1/2 has seemed to work well for me though! has anyone else tried suja? what were your thoughts on it?! It's always nice to give your body a break and drink your nutrients!! They actually look really good!! 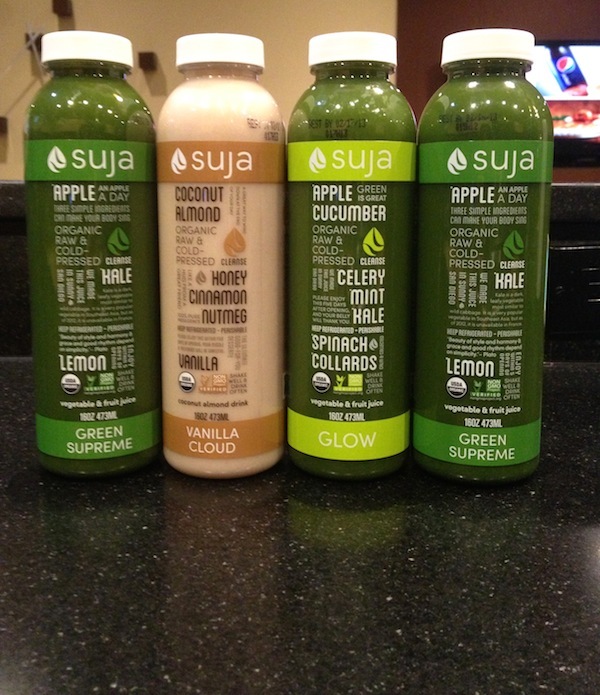 I haven't tried Suja, but we started juicing recently, mostly my hubby. I am going to make a post on that soon. Come check it out sometime next week :) Would love to hear your opinion on that. They seem great! I wish we had a whole foods to buy some at! You can get them online at sujajuice.com! i've been wanting to do a juice cleanse! Of course! Not to be biased because I haven't tried any other cleanses, but I would recommend this one for sure! I totally want to try this now! I mentioned it to my hubs and can't get it out of my mind hahah. Thanks for the info! I think you would love it! I would definitely recommend it! Do they have these at trader joes by chance? now i want to try this! I've seen it on a few other blogs too. definitely good for people like me who never get their full servings of fruits and veggies ;) Thanks! I just tried them! I loved the Green Supreme and Vanilla Cloud! I couldn't really handle the Master Cleanse or Purify ones though! Thanks for sharing about it! What did you drink for the 3rd day? Just curious what your entire schedule was and which types. Thanks.